All of us have to clean our house. And even though we might not think about it too often, our household cleaners actually have a major impact not only on the environment, but on our health as well. The Environmental Protection Agency (EPA) reports that the toxic chemicals in common household cleaning products are 3 times more likely to cause cancer than air pollution. And, the Toronto Air Conference reports that women who work in the home have a 54% higher death rate from cancer than women who work outside the home. Common household cleaners are literally poisoning every breath we take. Which is why it’s so important to use natural, eco-friendly cleaners! Natural cleaners are plant-based, and contain no toxic chemicals. This also means they’re biodegradable, and won’t harm local watersheds when they go down the drain. When Planet/Green Forest asked if I’d be interested in doing a review of their household products, I jumped at the chance. I’ve been using Green Forest recycled toilet paper, but hadn’t tried any of their natural household cleaners. So, the company sent of a box of samples for me to take a look at. 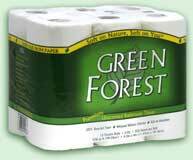 I’ve been using Green Forest recycled toilet paper for months now, and I’ve been happy with it. In my neck of the woods I don’t have a lot of choices when it comes to recycled toilet paper (in fact, I get once choice: Green Forest!) Unfortunately my local grocery store only carries the single rolls, so I was happy to get to try the double roll, which I like much better. The single rolls I usually buy are a bit loose, but the double was great. There was a ton of paper on the roll, and it was packed tightly. I also thought the double roll was a bit softer than the single I’d been using. Green Forest uses 100% recycled paper to make their toilet paper, and 90% of that paper comes from the stuff we’re recycling in our homes and offices. The paper is also whitened without using chlorine bleach. Final thoughts? I loved it. I really wish I could talk my local grocery store into carrying the double roll because it really was a better quality, I thought, over the single. The second product I tried was the Planet dishwashing liquid. I’d been using Seventh Generation, so I was anxious to see how Planet’s soap stacked up to my old favorite. I’m happy to say I was really impressed. Planet dishwashing soap actually kept their suds on my dishrag longer, which meant that for each sink of dishes I washed, I ended up using less soap. I was very happy about that. There was also no fragrance, which I liked. And I used it several times to clean my Honeycrisp Apples, and there was zero soapy taste when I ate them, so it rinsed clean. Final thoughts? I think the little health food store the next town over carries Planet, and I think I’m going to make a permanent switch. It lasted longer than Seventh Generation soap, and sudded up well even under cold water. All good things. The last product I tried was the Planet Liquid Detergent. And like all the other products I tried from this company, I was happy with how it performed. The detergent has zero fragrance or dyes, and worked just as well as the Kirkland Eco-Friendly laundry detergent I was using. My clothes got just as clean as they always have. I loved everything I tried from this company, especially the dish soap. There was nothing I didn’t like. I’m thinking about starting to buy the Green Forest double rolls in bulk off Amazon, simple because it was so much better than the single rolls I’ve been using. All in all, I’m giving the Planet/Green Forest products five out of five stars. Thanks for this! I usually only see and hear things about Seventh Generation cleaning products so it’s nice to know of an alternative and how it compares. Have you ever compared home-made cleaning supplies made with baking soda? You should take into account the extra resources and energy required to pack and ship toilet paper to you from Amazon.